Fractured-also known as broken-bones are among the most occurring orthopedic issues in the United States, with roughly 6.8 million medical bone cases reported a year. Most common in children under the age of ten or adults over the age of 65, bones have the potential to bend to a certain degree until enough outside force is applied to snap the bone, resulting in a crack to the bone or a complete break. Aside from the severe pain and restricted movement obtained from the initial break, fractured bones can also lead to a variety of future issues. Post-fracture infections, improper regrowth of the broken bone, or stress on plates and bones surrounding the fracture can persist if the initial fracture is not addressed properly. When one encounters a broken bone injury, it is a point of concern to discover who or what is liable for the excessive outside force causing the fracture. Furthermore, a broken bone often forces the injured party to wear a cast for several weeks or months, potentially preventing the injured from performing at his or her daily job for an extended time period. Benson and Bingham is on hand to help you recover medical expenses and possible workers comp in the event of a bone break or fracture - Contact us Today: 702-382-9797. Hip, Pelivis or Femur Fractures can Be Debilitating Injuries. 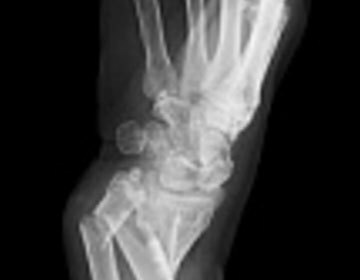 Broken Bones can include Hand or Feet Fractures.